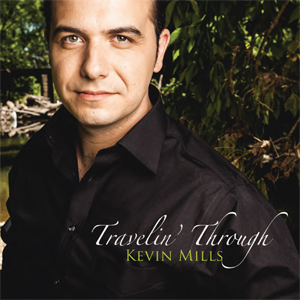 Kevin Mills is a Canadian-born country/gospel singer. Born in Winnipeg, Canada in 1985 to the son of a traveling evangelist, Kevin grew up with his family while traveling/touring churches across North America. His first appearance on stage was at the age of 8, and over the next 15 years Kevin would open for his father as a soloist at countless evangelistic meetings and crusades. Since then Kevin has worked extensively within the music, radio, and voice-over industry. Kevin is currently working with Song Garden Music Group/Grapevine Records of Nashville. This is the same label that represents such musical greats as the Chuck Wagon Gang, Dixie Melody Boys, Jimmy Fortune (from the Statler Brothers) and more. This new project from Kevin Mills was a pleasant surprise. I don’t normally like a solo project, but Kevin’s deep baritone vocals won me over. His voice reminds me of the old country crooner, Don Williams. Maybe it was Kevin’s cover of William’s song, “You’re My Best Friend”, that reminded of William’s vocals, but nonetheless, their vocals are similar. This is the 3rd project available from Kevin and is a good CD to listen to while driving, working or just relaxing. My favorite tracks included ‘Walk On The Water’, ‘Travelin’ Through’ & ‘You’re My Best Friend’.